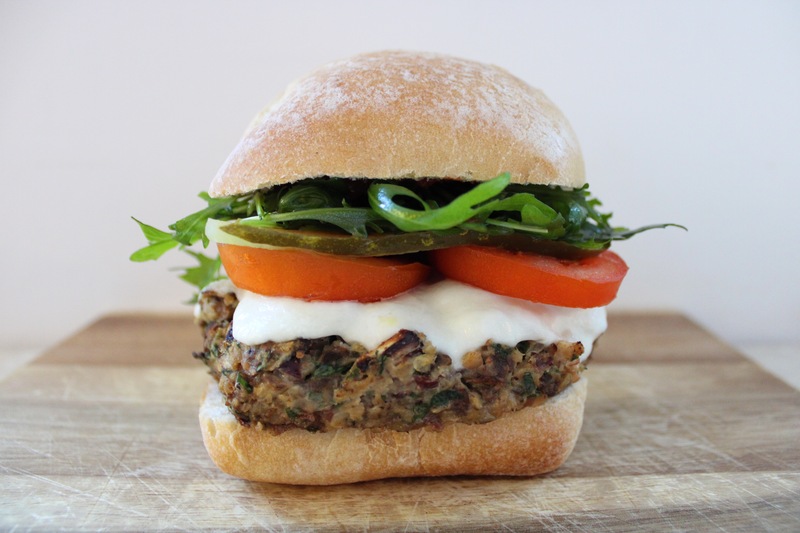 The biggest and meatiest veggie burger you will ever try with a Twintastico Italian Twist! This veggie burger really delivers! The porcini mushrooms make this a meaty burger, without the meat! Packed with flavour, it’s easy to make and very, very satisfying… Just like us! To start add the porcini mushrooms to a small bowl of warm water and leave to soak for around 20 minutes, then drain. Add the chestnut mushrooms, porcini mushrooms and onion to a large skillet pan with a little extra virgin olive oil and fry for around 10 minutes. Leave to cool. In a food processor, add all the beans, basil, parsley, egg and onion and mushroom mixture. Season with salt and pepper and blitz until a rough paste. Once blitzed, it’s time to form your burgers. Once formed add back to the skillet pan and fry for around 2-3 minutes each side. Be careful when flipping over not to break the burger. When flipped add the mozzarella on top until melted. Now it’s time to make the burgers. Slice the ciabatta roll in half. Add minced garlic and finely chopped black olives to the mayonnaise and spread over one half of the ciabatta roll. Spread the ketchup on the other half of the roll. Dress the arugula/rocket with a little extra virgin olive oil. Add the burger to the bottom of the ciabatta roll, then start to build the burger, add the pickles/gherkins on top, then the tomatoes, then the arugula/rocket, then top with the other half of the ciabatta roll.